There are many great foreign language films that have come out over the years. The films that immediately come to mind are “House of Flying Daggers,” “Let the Right One In” and “Pan’s Labyrinth” just to name a few. But with so many films to come out yearly, it’s easy for films to slip under the public’s radar. “Brotherhood of the Wolf” is just one of those films. My dad introduced it to me years ago, and I have revisited it a couple of times since then. 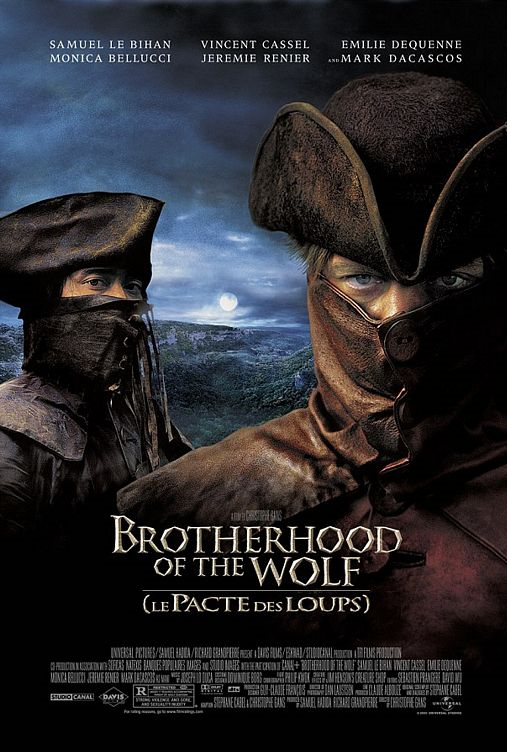 Brotherhood of the Wolf is a 2001 French film directed by Christophe Gans (“House of Voices,” “Silent Hill”). The film stars Samuel Le Bihan, Vincent Cassel, Monica Bellucci, Émilie Dequenne and Mark Dacascos. The story takes place in the 1760s where a mysterious beast is terrorizing the French lands of Gévaudan. Two warriors enter the town to dispose of the beast. As the story evolves, the women are tempted by two lovely women of the town while the secrets of the town and beast are revealed. The action in the film is awesome. The very beginning of the films provides a fight sequence in the rain that features are two main protagonists. The choreography and the actors’ abilities are showcased very well. It gets better as the film goes on providing a great climax. Two other high points of the film are Monica Bellucci and Vincent Cassel. Bellucci and her assets are shown off very well in the film. After this film, her American film career really took off with movies like “The Matrix Reloaded,” “The Brothers Grimm” and “Shoot ‘Em Up.” Vincent Cassel has been an actor that has interested me in every role I have seen him in. He was the only part I enjoyed on Ocean’s Twelve. He was fantastic in Eastern Promises opposite Viggo Mortenson, and he looks at the top game in the trailer for the upcoming Black Swan. If you are a fan of good action films then this is a must see. It provides an intriguing story that will keep you interested all the way through. It may not be the best foreign film to be released in the last ten years, but I feel it is definitely worth a view. What is your favorite foreign language film that has recently been released? Have you seen this movie? Let us know in the comments below.